Alkyone leads her sisters towards Hippolyta’s chambers, intent on slaying the newly birthed Diana, or “Dragon” as they refer to her. As they approach the entrance though, resolved to the fact that what they will do tonight will surely result in their own deaths, they are confronted by Phillipus, the Amazon Captain. She asks why they approach the sleeping queen so stealthily and fully armed. Alkyone replies that the suspicious Phillipus knows full well the reason why they are here and orders her to let them pass. Phillipus draws her sword but is struck down by a couple of arrows and is left for dead! The four amazons then creep into Hippolyta’s chambers and they see the queen lying asleep on her bed, cradling Diana in her arms. Alkyone steps forward and holds her sword aloft, preparing to strike. She pauses, staring down at the beautiful baby girl – “more radiant than a thousand suns”. The others are also struck by the child’s grace and innocence and begin to question their task. But Alkyone steels herself and tells them that they are not wrong in what they do tonight. As she readies herself to plunge the sword through the child’s heart an eagle flies by, screeching loudly. Alkyone is momentarily distracted and wonders if it is an omen. The bird however also wakes Hippolyta, who instantly reaches for her own sword and lashing out, slices through Philomela’s eyes, blinding her. She then cuts Alkyone who falls to her knees by the bed. The amazon finds herself at eye level with Diana, who stares back at her nether crying nor turning away in fear as the fight rages around her. For a fleeting moment Alkyone feels inexplicably proud of her – and realises that she is so like her beloved Hippolyta. Suddenly the wounded Phillipus arrives with a squadron of guards and orders Alkyone and her sisters to be killed as traitors. A panicked and confused Myrto turns to Alkyone in desperation, asking what they should do. Coldly, Alkyone gets to her feet and tells her sisters that they are now damned and that they have no other choice but to fight like amazons…. 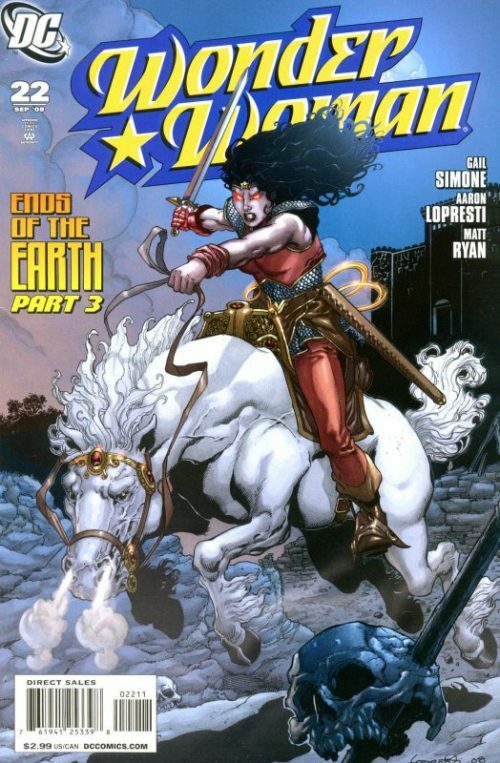 On Themyscira a squadron of Nazis is making their way across the island searching for Hippolyta’s body. One of them comments how he is not comfortable with staying around here to be eaten by apes. He is reassured by his comrade that the apes had retreated and that they need to focus on the task at hand. His colleague asks whether he is really sure the Amazon Queen had been killed and is told by the other that they had her shot up real good. Just then they hear a noise coming from the clearing ahead of them. 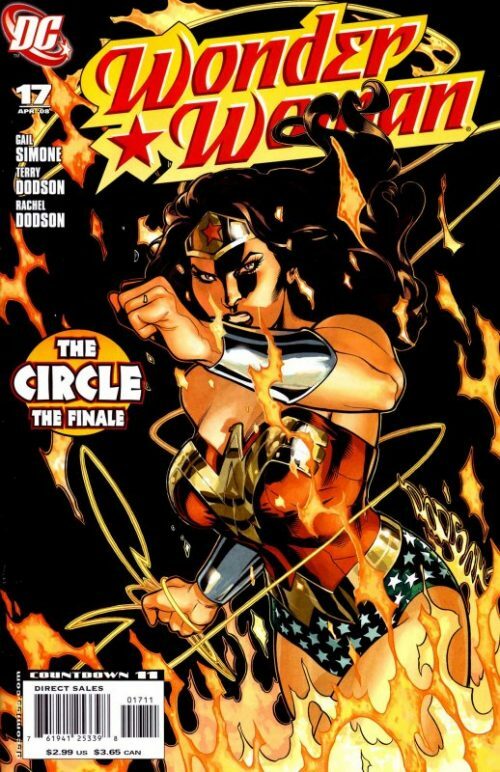 As they emerge they find to their horror that although they have found Hippolyta – they have also found her daughter – who stares back at them, arms crossed, fiercely determined to remove these invaders from her homeland. 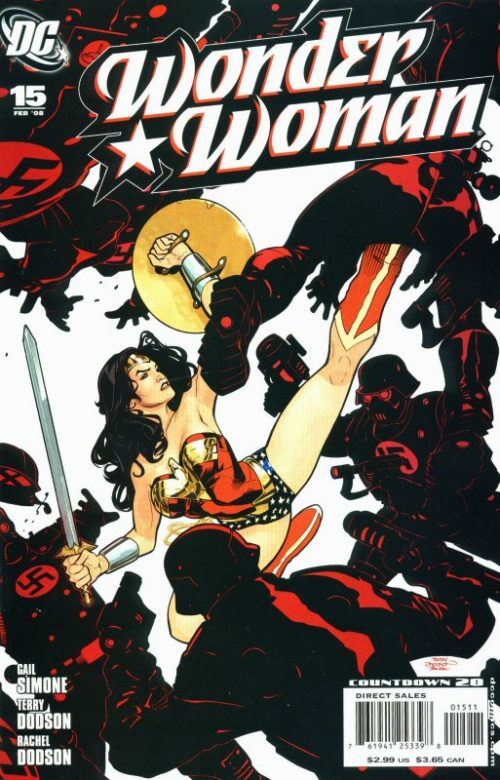 In a flash Wonder Woman explodes into action and tears through the surprised nazis until a minute or so later they either lie on the floor unconscious or have already fled. As Wonder Woman grabs a fleeing soldier he pleads for mercy and surrenders. Diana pauses before dropping him to the floor and soon the remaining nazis are assembled on the beach, boarding their landing craft under Wonder Woman’s supervision. She turns to Tabitha and instructs her to take her men and to depart the island immediately. Tabitha reminds her that the Society had helped them get to Themyscira once and that they could always return in the future. Wonder Woman simply replies “You could. But you wouldn’t”. As she watches the nazis sail away she adds that the huge sharks that swim off the coast have now got the nazi’s scent. Not far away hidden in the undergrowth Alkyone, Myrto, Philomela and Charis watch Diana’s movements. Philomela comments that she fights like her mother but Alkyone simply instructs her to “let her know we are here”. The blind archer raises her bow and fires two arrows in quick succession. They strike Wonder Woman in the right shoulder before she has time to react. She falls to the ground in shock and plucking the arrows from her body, wonders how arrows could not only pierce her but move so fast that she did not se them coming? They obviously have the taint of wild magic about them. Alkyone then emerges from her cover and addresses Diana where she lies. She tells her that they have taken Hippolyta as she is their responsibility in dying as she was once in life. She asks if Diana knows where the “broken bridge” is and instructs her to “walk the statuary path”. If she rises above it or leaves it the “ceremony begins early”. Diana knows that the bridge leads to the site of a funeral pyre and realises what Alkyone intends to do with Hippolyta. As Alkyone quickly disappears into the undergrowth again she shouts back that if Diana alerts her ape friends the pyre will become a sepulcher. She adds that Diana has no knowledge of the amazon tribal beginnings, or of what the amazons were before culture, by firelight and steel. There are four of them standing between her and the queen. ” See if your way, your weak, polite way, survives”. Alkyone rushes through the forest and instructs the others to take up their positions. As Wonder Woman races towards the spot not far behind she suddenly finds herself under attack from a hail of arrows. One of them strikes her other shoulder and she cannot understand why she is unable to deflect them in time. Myrto suddenly charges at her from nowhere armed with a trident. 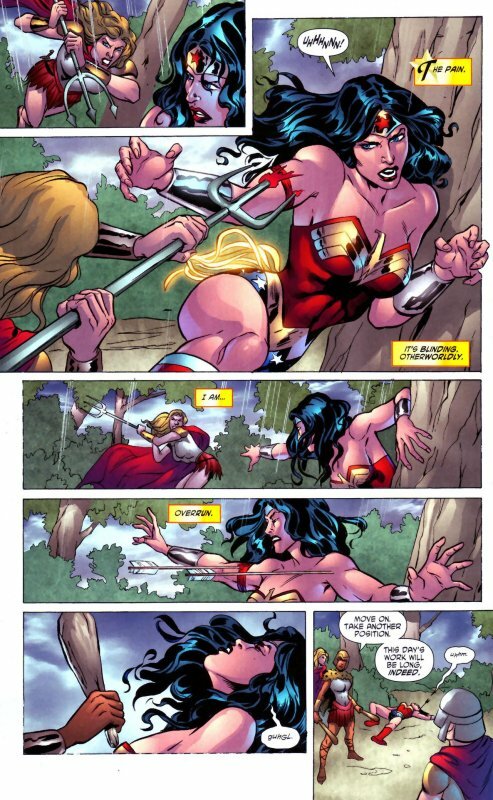 Wonder Woman attempts to dodge her lunge but is impaled in the arm. Before she can even process the intense pain another two arrows strike her. As she struggles to stay on her feet Charis appear from behind her and clouts her over the head with a club. Wonder Woman falls to the floor, groggy and the three attacking amazons take up new positions further down the path. Not far away at the broken bridge, Alkyone stands over the funeral pyre where the wounded Hippolyta lays. She tells her beloved queen that her daughter comes to her death and the queen weakly replies that Alkyone is wrong and that Diana is not the demon she foresaw. Alkyone responds by asking a question. “Why did you choose the four of us to guard you?” Hippolyta replies “You loved me best”. She is then tenderly kissed on the forehead by Alkyone who says “It was true. It remains true”. Back down the path Charis is organising the others for the next assault on Wonder Woman and reminding them not to underestimate her. Suddenly though a golden lasso snakes down from the branches above her and she finds herself hoisted aloft! Wonder Woman darts from her cover and grabs Myrto’s trident, trying to wrestle it from her grip. She uses it to hurl the surprised amazon straight towards Philomela, the archer, who she knows is the biggest threat due to her ability to attack from distance. Charis uses her club to break the branch, allowing herself to drop back to the floor and join the battle, as Philomela gets to her feet and raises her bow again. 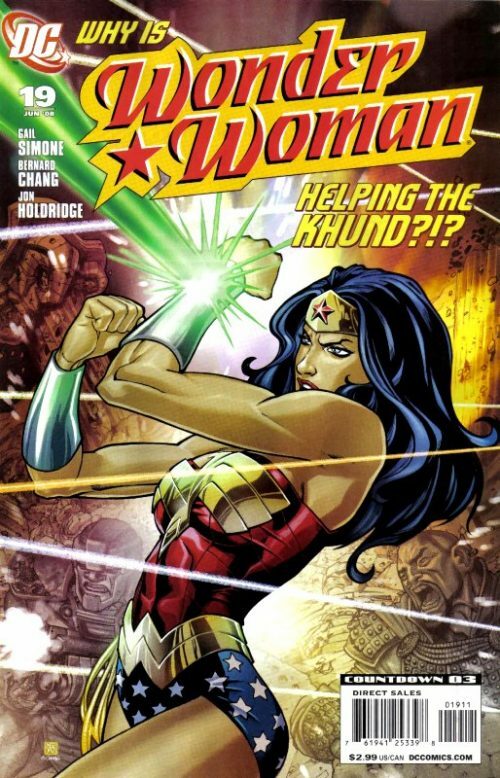 But Wonder Woman already has Charis’ trident and throws it at Philomela, smashing the bow in half. Diana knows she lacks the power to break a weapon gifted by the gods so her only recourse is to use another just like it! As the three amazons charge at Wonder Woman she prepares herself for battle – and to fight like the true amazon her mother brought her up to be. Soon Alkyone sees a figure approach across the bridge and to her surprise she sees it is Wonder Woman, who drops the collected weapons of Alkyone’s sisters to the floor, indicating her triumph over them. 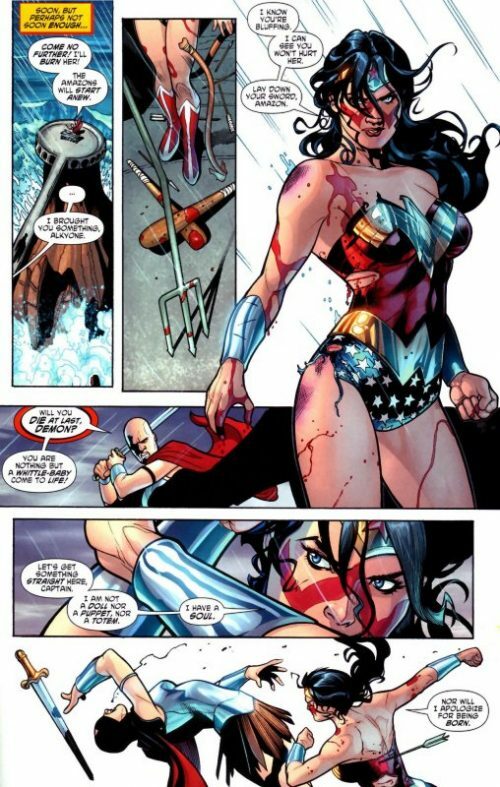 The bloodied and bruised Diana then orders her foe to lay down her own sword and adds that she knows Alkyone has too much love for Hippolyta to burn the queen alive and never had any intention of harming the queen. But the amazon raises her weapon instead and cries “Will you die at last demon? You are nothing but a whittle-baby come to life”. Wonder Woman raises her bracelets in defense and replies that she is no doll nor puppet nor totem. She has a soul. With that she punches Alkyone hard, sending the amazon tottering to the floor and causing her to drop her sword before stating “Nor will I apologise for being born”. Just then Hippolyta calls out to the fallen amazon captain, explaining that because of her subsequent imprisonment after the assassination attempt, Alkyone could not have know that Diana’s birth did not destroy Themyscira at all. All the amazons became her mother, as one. She brought them hope and love. She saved the amazons. But a stubborn Alkyone refuses to believe her queen’s words. 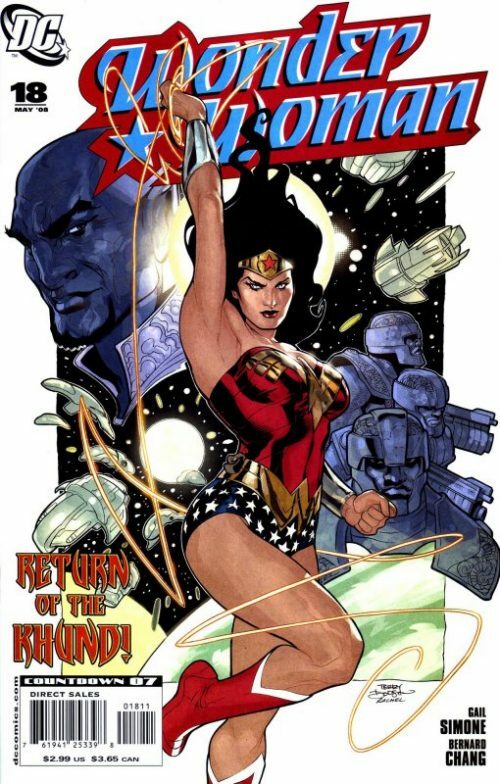 Wonder Woman stands over the kneeling amazon captain and asks if there will be peace between them or not? Alkyone replies that Diana will destroy the amazons – she is sure of it. She then tells the Amazon Princess to kill her now or else she will surely find a way to kill Diana. 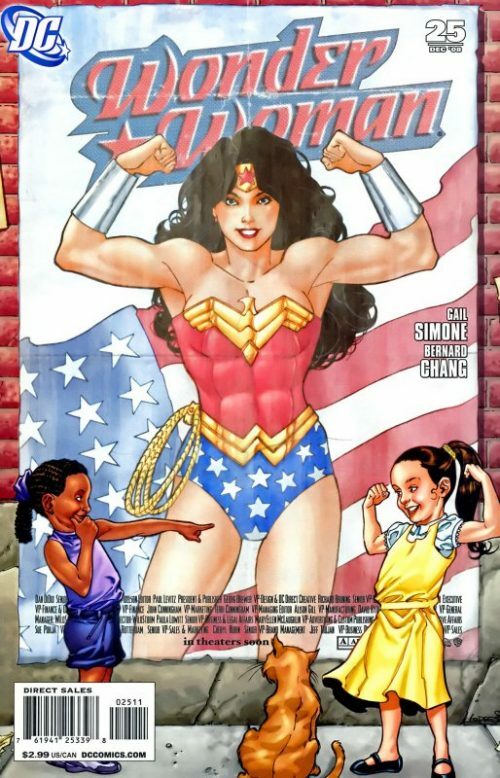 But Wonder Woman instead gently holds her foe’s head in her hands and says that she will do no such thing. She forgives Alkyone’s actions and taking her hand, asks her to come back to the tribe. As Alkyone bows her head in seeming submission she murmurs “you could have been mine”, finally revealing that her motives are more driven by envy than hate. Some time later Diana prepares to depart Themyscira. The Amazon Princess had searched for hours but had found no trace of Alkyone, other than a lot of blood in the water. It would seem she had fallen prey to the sharks. Myrto, Charis and Philomela had been returned to their prison cells while some of the apes had decided to remain on Themyscira for a while and look after the recovering Hippolyta. Before Diana departs Hippolyta asks her why she wears the standard of an outsider god? Wonder Woman replies that their own gods had almost let the amazons pass forever. Why should they continue to worship them after all they have done to the amazons? Hippolyta simply replies “Because they gave me you , daughter”. 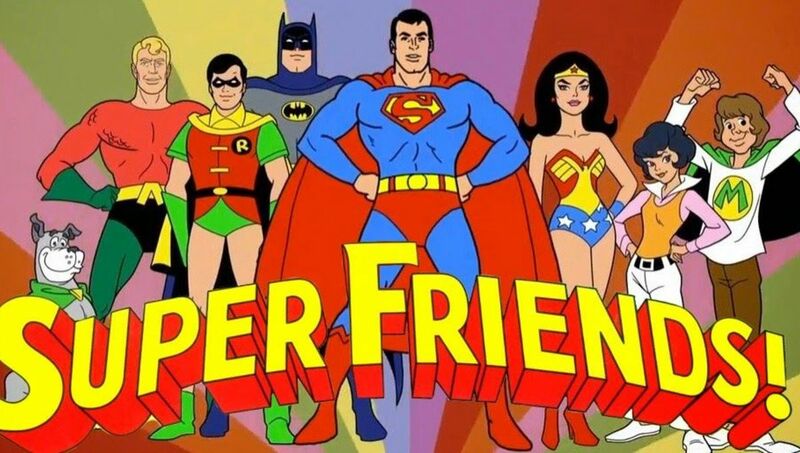 A few hours later Wonder Woman arrives for a belated birthday party in her apartment, surrounded by her Justice League friends and Etta. The two women hug warmly and we learn that Etta knows that she is posing as agent Diana Prince at the Department of Meta Human Affairs and had actually taken on Sarge Steels assignment to investigate the agent in order to ensure her secret remained safe. Wonder Woman and Etta momentarily step outside onto the roof for a while to take a break from the festivities downstairs. As Etta begins to talk about the weird individual she had found in her apartment a few days ago she notices the Amazon Princess’ melancholy face. Diana tells her that she had watched an Amazon die tonight. She feels she deserves to know why. Etta replies that although she does not know what Diana has gone through over the last few days, the Amazon Princess has she knows better than anybody that people die. Diana agrees but adds that it should be for a reason. “I am an avatar for truth Etta. And yet, I’ve never taken the time to shine that light on my own making. Alkyone was trying to tell me something. Etta reassures her friend that the Amazon Princess will always find the truth.